Take Current Affairs quiz February 2, 2019 to enhance your General Awareness. Practice with our esteemed Current Affairs quiz February 2, 2019 questions which covers all important events across India as well as World. Make use of all important Current Affairs quiz February 2, 2019 questions with answers updated here, at free of cost to succeed in all competitive Exams and Interviews. What are the 2 bills that are to be lapsed once the 16th Lok Sabha’s term ends? The Citizenship Amendment Bill and the triple talaq Bill are the 2 bills that are to lapsed once the 16th Lok Sabha’s term ends. Which is the capital of China? Who is appointed as the new Director General of Police of Bihar? Gupteshwar Pandey, the Senior IPS officer, took over as the new Director General of Police of Bihar. He succeeds K.S.Dwivedi. Mr.Dwivedi has been holding the position since March 1, 2018. How much did the Centre allot for the Home Ministry in the interim Budget 2019? The Home Ministry has been allocated over Rs.1 lakh crore for the next fiscal, with special emphasis on improving border infrastructure of police forces, in the interim Budget 2018-19.
Who is appointed as the Director-General of Police, Haryana? K.P.Singh, Senior Indian Police Service officer, took charge as officiating Director-General of Police, Haryana. This is in addition to his present duty as D-G Human Rights Commission. Which Country is to lend a loan of $1 billion to Beijing's major highway project linking Colombo to Kandy? China is to sign a $1 billion concessional loan agreement with Beijing. The agreement is to fund a major highway project linking Colombo to Kandy. Which bank senior group president Pralay Mondal resigns? Yes bank senior group president Pralay Mondal resigns. For how many years did the government extend the ban on SIMI? The Ministry of Home Affairs extended the ban on the Students Islamic Movement of India (SIMI) by five more years. The Ministry said SIMI was declared an “unlawful association” under the Unlawful Activities (Prevention) Act, 1967. Sanjiv Ranjan is appointed as the Ambassador of India to the Republic of Colombia. International conference on 8th century sage held to mark 50 years of India-Bhutan ties. Are you looking for right place to enhance your Knowledge on Current Affairs of 2nd February 2019 through effective Quiz section? 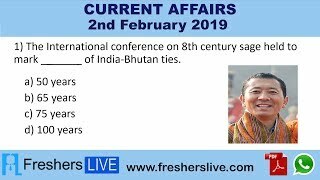 FreshersLive grants you the advantageous Current Affairs Quiz questions with accurate answers for 2nd February 2019 which covers all the important events, supreme Awards, major occurrences in the National as well as World level. All important Current Affairs Quiz questions of 2nd February 2019 are updated instantly in this page. Everyday at least 25+ Current Affairs Quiz Questions are displayed in this FreshersLive page. Correct Answer for each quiz question is given at the end of the entire 2nd February 2019 Current Affairs Quiz questions section. You can estimate and upgrade your GK by attending these useful quiz questions. Entire quiz questions of 2nd February 2019 Current Affairs covers Competitive Exam as well as Interview point of essentially important topics like International News, National News (ie. Indian Affairs), Science & Technology News, Environmental News, Bills & Acts Passed by Government, Defence News, About important Persons, Places, Banking & Economical News, Awards & Honours, Sports News, Revolutionary Updates on Arts & Culture, Obituary, Summits & Conference, Important Committee, Schemes, Appointments, Important Days & its Theme for Current as well as upcoming Year, Books & Its Authors, Agreements & MoUs, Budget, Taxes, Various Important Lists & Indexes, Visits by World Presidents, Prime Ministers, Political affairs and all Current Events. 2nd February 2019 Current Affairs Quiz Questions updated in this page are prepared in the sense to help all aspirants to succeed in various Competitive Exams like UPSC IAS and other Civil Services Examination, Various Bank exams like IBPS PO, IBPS Clerk, SBI PO, SBI Clerk, RRB PO, RRB Assistant, Insurance exams like LIC AAO, UIIC Assistant, Railway Exams, Various Central Government Exams like SSC CGL, SSC CHSL, and more. Attempt all the Current Affairs Quiz Questions of 2nd February 2019 and evaluate your score by matching your response with the correct answers mentioned at the end of this quiz questions section. By practising the FreshersLive Current Affairs Quiz Questions on a daily basis, you can surely succeed in the competitive exams as well as the interviews easily. Make use of this ultimate resource to the fullest and quickly achieve your goal!